Is It Safe to...Use Last Year's SPF? As a worrier; I'm the sort of person that will find something to fret about, anything, I run on a constant nervous energy - I find myself mulling over somewhat mundane things. Counter productivity at its best but on the upside I do tend to have answers for things that most will never ponder. While clearing out I found a whole stash of half full bottles of sunscreen and instantly assumed that they would not be safe to use this coming Summer. Wrong! Growing up, I won't beat around the bush we were not well off by any means - seven children will drain your resources quickly but one thing my Mother never skimped on was sunscreen. The smell and thick texture of Ambre Solaire SPF will always takes me back. Once the long, hot Glaswegian Summer was over (hopefully you can detect the sarcasm), all the white and orange bottles were quickly disposed off. Why? I have no real idea as most would still have lotion held within. This is a habit as an adult I have fallen trap to, only on a wider scale. First of all SPF much like any cosmetic product has a use by date, it will be marked on the back of the bottle or can; look for a round container mark with an ajar lid - it will indicate how many months it will be effective for after use. Sunscreen is typically safe to use up to 36 months after opening - that date is not a gestimate for legal and health reasons. Next up and probably the reason I used to throw out sunscreen regularly - taking it to the beach nor having your SPF bottle in the sun will not affect the protection effectiveness. 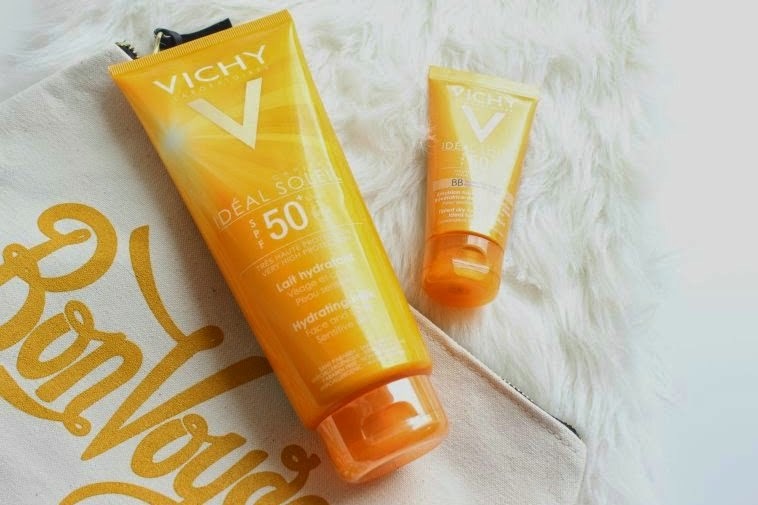 Before going on sale sunscreen undergoes a whole range of tests (in laymen's terms of course), not only to ensure that the chemical compounds are safe for the skin but also that it will not be affected by extreme temperatures nor UV rays. So no more burying your sun lotion in the sand (yes I really have done that), nor questioning if it is safe to purchase sunscreen in Spain (again a real life snippet). If like myself you were in the habit of disregarding half used bottles of sunscreen each year for the same above reasons - don't! We now know that it is perfectly safe and effective to use as long as it is within the use by date. I have taken to labelling my large bottles of SPF with dates regarding the first us, thus cancelling out any future guess work - a little extreme but then again I've always enjoyed my label maker. Great tips and post in general, I always worry whether my SPF is out of date or not but I think as long as you keep it sealed and only for 36 months and it doesn't smell then you're okay! Thank you so much for this post Adrienne! I was always wary of last year's sunscreen but then the bottle said it was safe to use! Confused! Thanks for clearing it out for me! I'd heard in the past that SPF expires after a year so this was good to know! I always wondered and ended up buying new ones haha! Thanks for this post, very helpful for pale skinned people like me! Ahhh so glad you said that! Really really great post. I don't know what you are doing with your sun screen bottles - but I take mine to the beach... and it gets very hot there. And the bottle gets vverrrry hot too! (And when I say hot, I mean it, sometimes it's painful to touch it). So imagine having the product going up and down in temperature daily for the whole season... would you really like to use it a year later? I don't think so.